Amid the proclamations that barrier has fallen, with the nomination of a woman for President by a major party, the race for November and the reconstruction of our government begins. I still believe that the choices presented by the major parties are incredible similar--even in their apparent differences. It should be an interesting run. There may even be another candidate looming on the scene, from the Libertarian Party who could become an alternative--although admittedly, at this point in time not an electable alternative, but one which might force the major party candidates to stop personal attacks and begin to propose concrete governmental reforms designed at strengthening our nations fundamental processes. And now the race is on. The sprint to election day. Sadly, I fear that the real mudslinging will now begin. I thought it was bad to this point, but it is only going get worse. The Orioles bats could not get it done. The team squandered a chance to increase their American League East Division lead by losing 3-1 to the Rockies. The game began as a pitching duel. Dylan Bundy had a perfect game going into the 6th inning. And then it turned ugly. By the end of top half of the inning, the Rockies had three runs on two hits. Both hits were home runs. The Orioles had left three men on base in the fourth inning. They had runners on the corners with no outs and then based loaded with one out but failed to push a run across the plate. Their only run of the night came on a solo home run from Manny Machado in the bottom of the sixth. Best play of the game? Chris Davis' bunt down the third base line against the shift in the second inning to break an 0-24 hitless streak. And that is why I am not a believer in video replay. If they can't get it right in the booth in slow motion, then they need to quit. Failing to get that one call right materially changed the game and the outcome. With the loss, the Orioles lose only their second series at home all season. The bats continue to be eerily quiet despite the heat. The pitching is strong, but not over powering. Frankly, it is weird to go to a game and see the O's score only a few runs, I am used to seeing numbers in excess of 5 on the scoreboard for the birds. But, these are the Dog Day's and perhaps the bats have been chased away. Summertime hot! The kind of hot that I look forward to during the summer. The hot that envelops me as I step outside after working in a sterile air conditioned building all day. It is a damp hot that I look forward to stepping into as I walk down the hallway at the end of the day. Twelve of the past thirteen days have been in the 90's with Monday touching 100 depending upon the thermometer being used. But, the hot is soon to be gone. 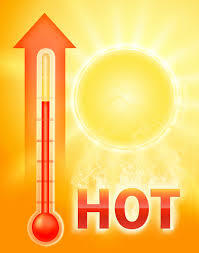 Today is forecast to be 5 degrees cooler than yesterday and soon the highs will be in the 80s instead of the 90s. Perhaps the heat is breaking and is over. We have had three BGE saving days where they pay me not to use electricity. It is the dog days after all. I see rain in the forecast and we definitely could use some rain, my lawn is losing its green. I realized that I am usually in Florida during the hottest days in Maryland, but not so this year. Hopefully, the summer will continue warm and supportive of outdoors activities. Taking center stage (or is it the middle ring?) last evening, the Democratic National Convention kicked off to highlight the other guys in direct opposition to last week. Despite the pre-convention hype, it was pretty much a carbon copy of the previous week's opening night. - The party is struggling for unity amidst allegations of favoritism during the primary season. 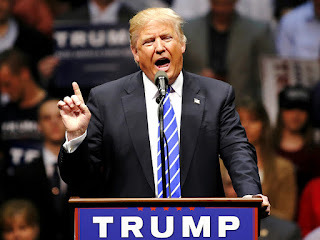 - They party is presenting the American people with a flawed candidate for President. - Instead of an actor providing some opening day remarks they included an impassioned speech by an 11-year old girl. - The candidate for the other party was vilified, repeatedly. - There was precious little mention of the "how" behind the statements. - True facts (or mostly true) were taken out of context to infer situations which are not true. More of the same? It sounds like it. 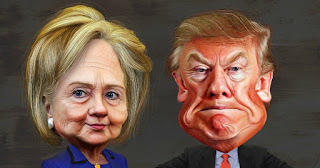 American politics has devolved into a game of "he said--she said, literally! Standing by for night two! And more, probably of the same. 1. I lost track of the date, because I've been off from work for three days and I had to check the calendar. I guess that is what it will be like when I retire. 2. What a great weekend. I played 36 holes of golf and got some projects completed around the house. 3. I saw a big heron yesterday while playing golf. 4. Having a 6:14 AM Tee Time meant we were off the course before the heat yesterday. It was great to be home before 10:30 after playing 18 holes. 5. The clouds were spectacular after the storms the other evening. 6. It is supposed to be extremely hot today! Be careful out there! 7. 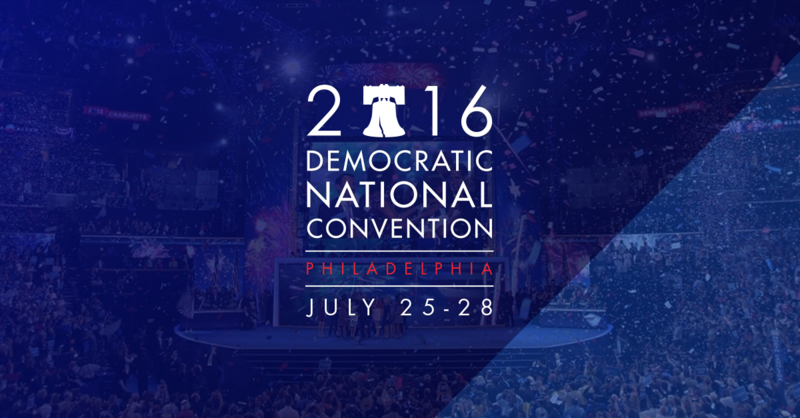 Strap in, this week it is the Democratic Party National convention. Should be interesting. 8. Lounging in the pool on a floatie with a glass of wine. What could be better on a mid-90's afternoon? 9. I ran across an interesting list of 239 people, places, and things that Donald Trump has insulted on Twitter. I didn't see my name on the list, but I'm not sure if that is good or bad. 10. It was a three-dog weekend around the house. Extra dogs sure do make for interesting times. 11. And so it begins--another workweek! The good news is, it's summertime! We enjoyed a dinner on the Magothy River at The Point Crab House & Grill last evening with Nicole and Mike. Although the day was hot and sultry, the evening was pleasant. Sitting at the restaurant along the shores of the Magothy River was enjoyable. The sky was threatening as we began our dinner and just as we finished the sky opened up with torrents of rain. The image does not clearly show the rain crashing down, but it is, I can assure you. 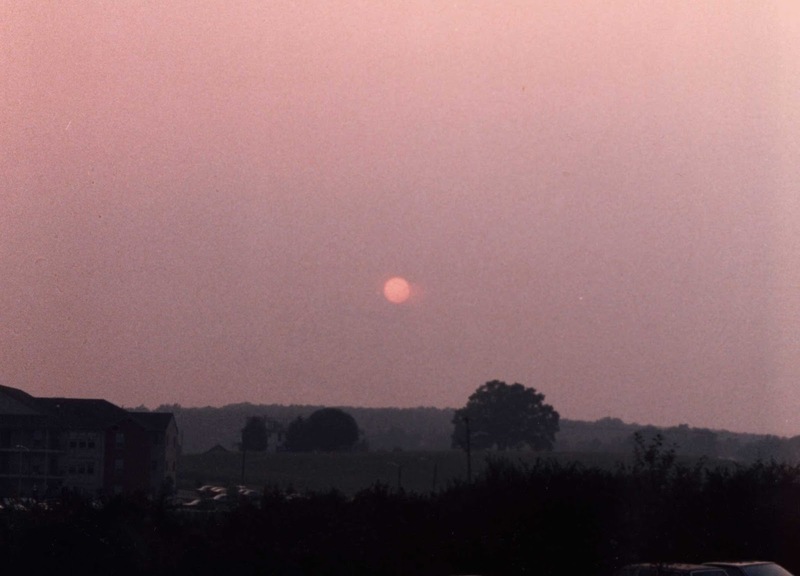 At one point the sun looked like Jupiter. Although we were eating outside under an umbrella, common sense prevailed and we moved inside as the rains began. Fortunately, we had finished eating--I left only a few fries behind on my fish & chips plate. It was a fun evening and a great time. The thunderstorm cooled the temperatures for providing a further respite from the heat of the day. A great day and a better evening even with the rain and storms--which were fairly brief. 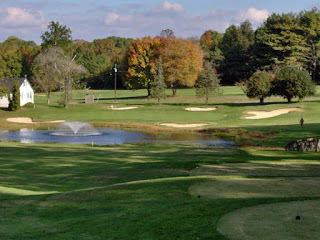 I had the opportunity to play in a tournament yesterday and I decided to take leave and enjoy a day on the golf course. It was scheduled to be a very hot day--and the weather report was correct. 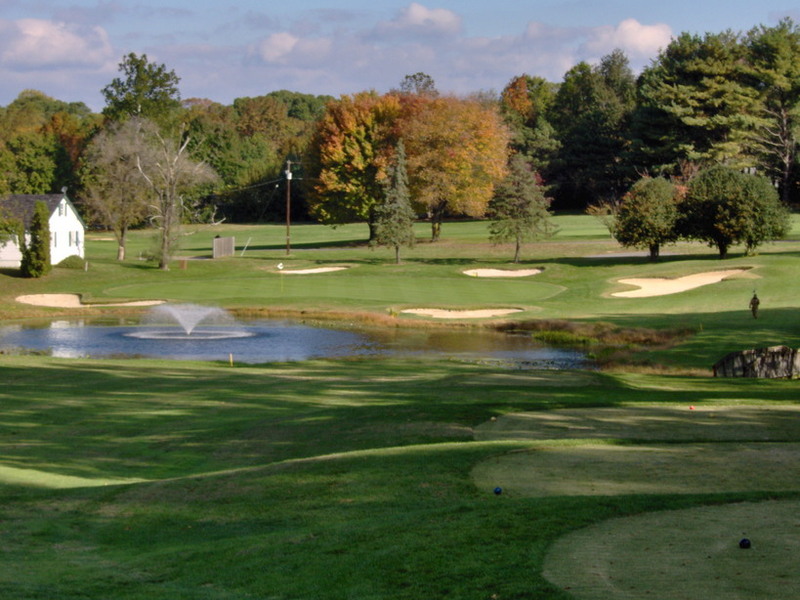 It was a beautiful day for golf and likewise a great day not to be in the office. I have become convinced that taking days off to do fun things is an important part of the life balance experience. It was a great day and our team played exceptionally well together coming in 2nd in the tournament! That was a definite treat. The team played well enough to provide options for almost every shot on each hole and that allowed someone to step forward and make the best shot for the team. It was a great Friday and a great was to spend a day outside of the office. Well, the Republican Convention has completed and we can get on with our lives, for three days. What's on tap for Monday? 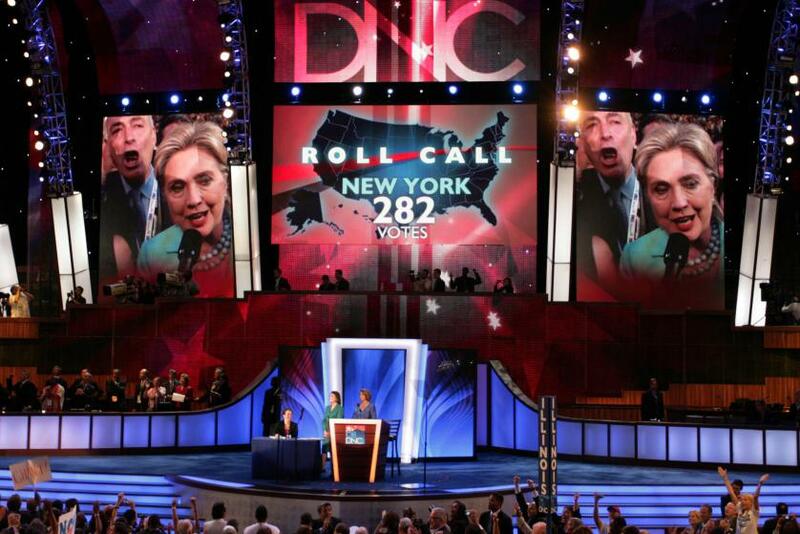 The Democratic Convention. 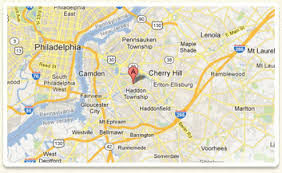 I am expecting less drama coming out of Philadelphia as the democrats convene. Their task is pretty well defined--support the status quo as an alternative to the negativity exuded by the republicans. My observations about the Republican Convention. -- You can't Make America Great Again if you can't convince someone that it isn't great right now. -- There wasn't a great deal of concert plans and programs discussed and offered just lofty concepts. -- The facts presented during the Trump's acceptance speech were mostly true. I checked them with the New York Times. -- Ted Cruz was perhaps the most interesting convention speaker because his observations were very different from the mainstream. Well it is game on. I wonder where it will end. Walking outside of the building after a long day of working in an air conditioned environment is an experience that I enjoy. I feel a sense of impending freedom from the workday and as I approach the glass doors I try to imagine what will greet me as I step into the outside world. I dislike the frigid slap in the face of the winter. Last week in California, I did not particularly enjoy to cool September-like air that greeted me and made me put on a jacket to maintain my comfort. It was July after all. Yesterday, I realized that I love walking into the outside and being enveloped in a warm and moist environment that greets me like an old friend and guides me deep into the summer heat. On a real summer day, I can see the moist heat before I step outside. The haze hanging in the air is a sure sign that I will be warmly greeted as I cross the threshold and head for my car. There have been far too many cold days this year. The smells of the summer are everywhere--the mowed grass baking in the sun, the earth. the scent of heat hanging in the air. It is the dog days, let's enjoy them. They will be gone too quickly. Well, despite what I wrote a few days short of a year ago, the Republican nominee for President was been crowned last evening. No longer do we have to hear the news media reporters talk about the "presumptive" nominee. Donald Trump is the Republican Nominee for President of the United States. The Republican primary season is over, the results are in and have been confirmed. Half of the stage is set for what is shaping up to be one of the most divisive presidential elections in the history of our country. Voter turnout in November could be either astronomical or it could be lethargic. My Take: There is change afoot. We, as a country as a society, are losing tolerance and becoming reactive and afraid. I have to believe it is a by product of the past 8 years although I do not fully understand how or why. I find the news reported battle between the old guard of the Republican Party and the newer members interesting. I have to admit--the old guard are trying to protect something that has been largely ineffective for the past 12 or more years. Maybe they need to embrace the change, for the good of the party--but then, it threatens their positions. 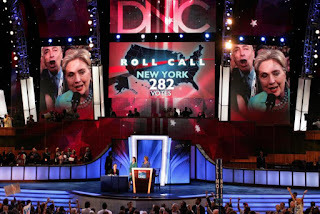 Perhaps, we are seeing the evolution of the two-party system into a multi-party free-for-all? Keep your eyes open--there could be significant backlash in November. I felt compelled to watch the opening night of the Republican Convention from Cleveland last evening. But they seemed real and genuine. The future of our country is at stake. November 8 is looming closer in our divided land. The election seems to be a polarizing event. The candidates are alike in their oppositeness. Both seem to view their only path to the presidency comes from bashing the other. 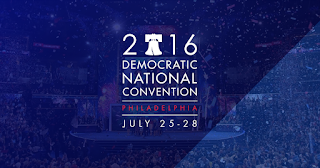 I will likewise watch the opening night and other nights of the Democratic Convention. I want to hear both sides of the issues. Sadly, given all of the mudslinging, there isn't much brainpower left to apply to the issues. I have talked to quite a few people who aren't sure they will vote in the November election. I encourage them to change their minds and exercise their very precious ability to vote and change the future. 1. I find it hard to believe that July is half over. It seems as if the summer is just finally getting underway. I think I need a summertime siesta. 2. Falling into the backyard pool after a round of golf on a hot Sunday is a great way to cool off. 3. 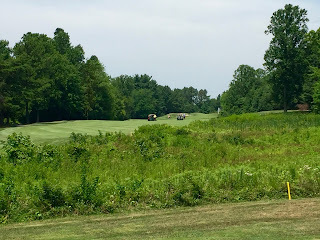 It was a great golf weekend, in concert with The Open, I was able to get in two rounds of golf-- both at the Crofton Country Club. 4. Cross country flying can be a draining experience, especially flying from Los Angeles. I don't think I still have fully reacclimatized to the time zone. 5. I can tell that the summer is moving along, it is getting darker earlier and the suns rising later. I checked, there is already 20 minutes less of daylight than at the beginning of the month. 6. My hands are covered with paint. Why is painting such a messy job? 7. I saw the Pacific Ocean last week, but was not able to sit on the beach and enjoy the sun, sand, and surf. I wonder when I will be able to get in a bit of "beach" time. 8. Someone I was traveling with proposed that the breeze coming off the Pacific Ocean smells different than the Atlantic Ocean breeze. I think it is true. 9. It is time for some mid-summer fun, before the summer runs out. 10. 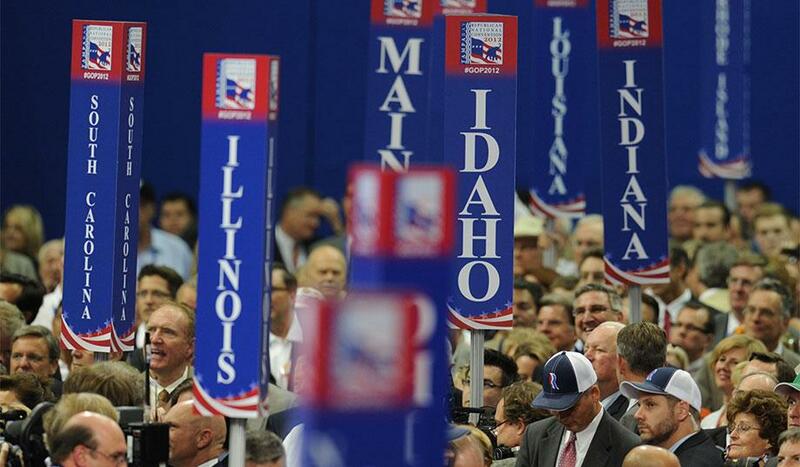 It is political convention time. Our future is at stake. 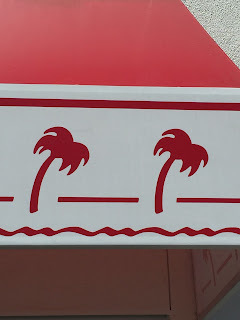 While in California, I experienced a new burger place--In N Out Burger. 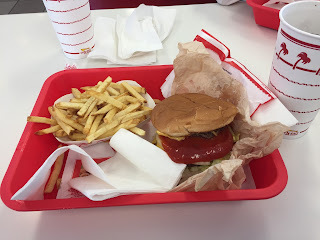 I am not a burger connoisseur, but some of my traveling companions wanted to enjoy the uniquely Californian burger experience. It is a good burger and ours were made to order--which is very nice. 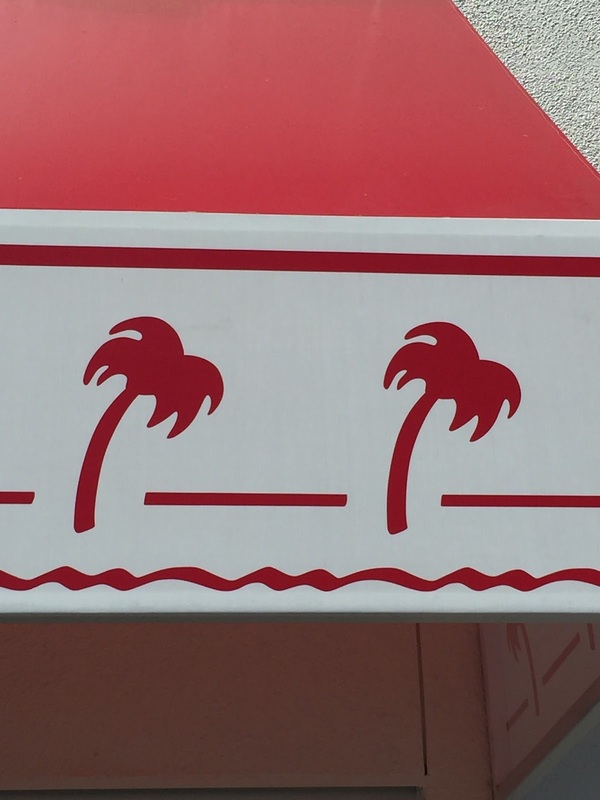 I did enjoy the palm tree motif on the roof line of the building. It was enjoyable, but alas--it is just another burger place. Some say it is similar to Five Guys Burgers and Fries. I can see that. At least it is uniquely West Coast. They have locations in Arizona, California, Utah, Nevada, Oregon, and Texas. 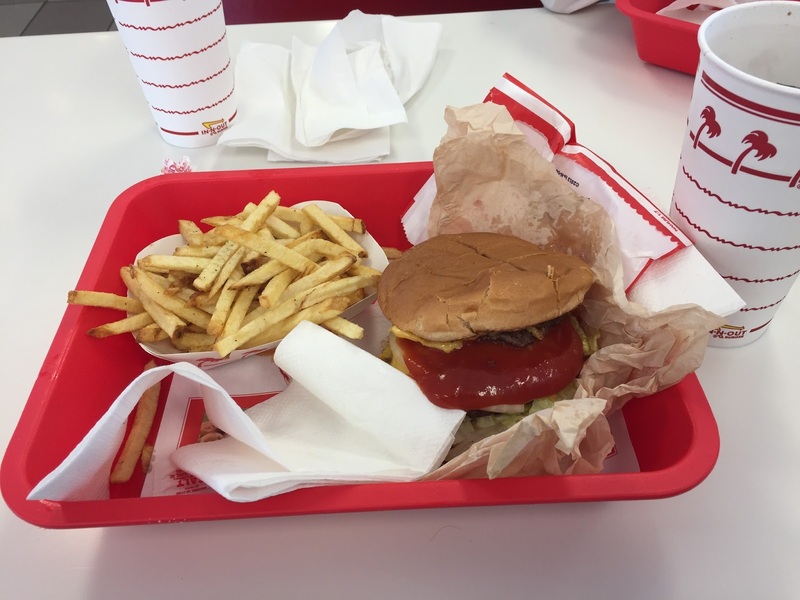 So if you need a burger fix--I'd recommend stopping and enjoying the food. 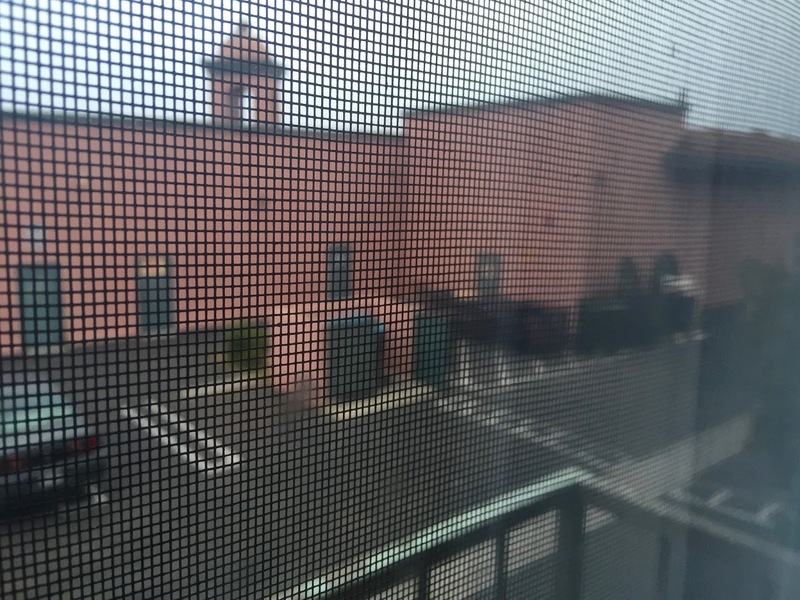 As the trip comes to an end and I am in a different hotel, I looked out the window of my room and was greeted with a less than spectacular view. 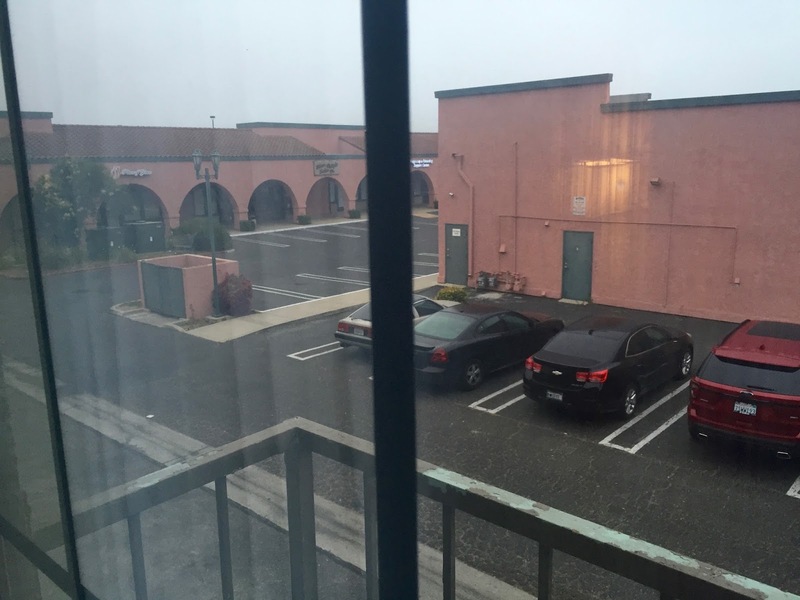 Sometimes, hotel don't consider the view that guests will have out their windows. In this case it is garbage and back alleys. The hotel itself is very nice to look at and a great place to stay, it is just that the back lot leaves a lot to be desired. I understand why the curtains are closed. Although the garbage truck did wake me during my first night here, the room is generally quiet. 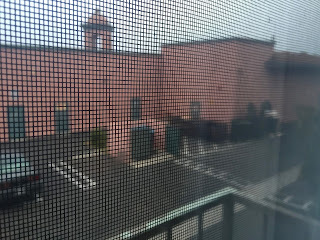 It is really amazing the different views that I have experienced out my hotel window on this trip. The weather has been the big story. 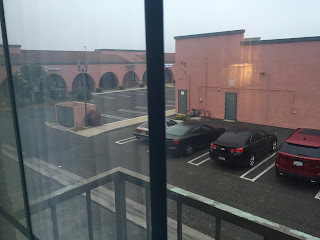 It is 55 degrees as I wake up on this July morning with an expected high in Lompoc of 68 degrees. I am looking forward to getting back to the 90's of Maryland and being in my pool. The hotel has a beautiful pool area, it is just that the air temperature is so cold I would never consider getting into it. The real reason to come here, however, is for the wines! More about that in the future. 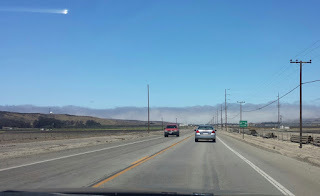 Driving along the coast near Lompoc, California, yesterday, we saw a huge fog bank, also called the marine layer, that seemed to be eating up the world. The resulting image was even more interesting that the fog ball which looks like something right out of the movie Independence Day. What was most interesting was the bright objects in the upper left corner of the image. We did not see them with our eyes--but they are definitely there on the image. Brings back memories of the mid-1960's and the UFO investigations. Is Roswell, NM, anywhere near here? Los Angeles is a big city. That realization obvious as the plane I was flying in was on approach and I could see nothing except houses and industry for miles and miles. I have been here before, but the sheer magnitude of the city has escaped me on the other occasions that I have traveled to and through here. The scene outside my hotel window is a cosmopolitan one. There is industry and airport as far as the eye can see. Downtown Los Angeles is just visible through the smog in the picture. 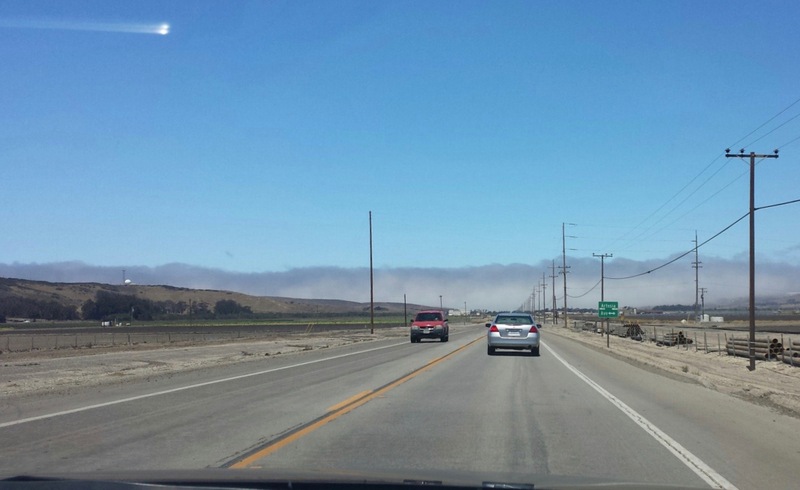 The mountains behind the city are almost invisible. Yes, there are mountains behind the city. The hotel is conveniently situated in between two of the main runways serving Los Angeles International Airport, which is better known as LAX. But with the curtains closed, my room could be anywhere because it is so quiet. I enjoy watching the planes land. I have a great seat to enjoy the constant activity at the airport. There is a whole world happening, outside the hotel windows. 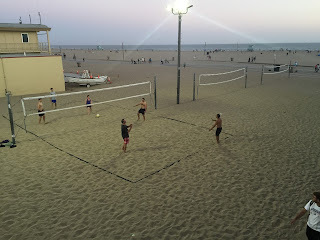 Last evening I had dinner in Santa Monica, one of those places that I have seen so much about in the movies. It exists and is every bit as diverse as I had been led to believe. I walked the bluffs above the Pacific Coast Highway and then down onto the iconic Santa Monica pier all while watching the sun set behind the mountains. It was a stunning sight as the mountains were silhouetted against the setting sun and I was not the only person with a camera trying to get the perfect shot of the activities. I was amazed at how wide the beach appeared. It was huge. Completely different from the narrow Florida beaches that I love. The pier and the walking promenade in Santa Monica city center were alive with throngs of people--even on a Monday night. It was an exciting sight. 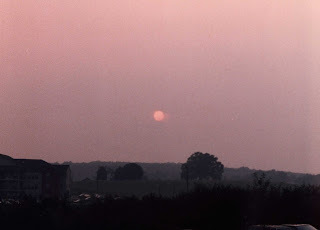 The setting sun cast a hue across the area that reminded me of the Sundown Celebration in Key West. It was definitely a celebration. I enjoyed the constant reminders of life and excitement. All in all it was an exceptionally long travel day, but it ended is a way that I could not have imagined. 1. Life is a balance. Sometimes it gets unbalanced and then bad things happen. 2. Blue skies are the best sky! 3. Why is it hard to have deep meaningful discussions with some people? 4. I love summer flowers! 5. Every time I just look at the pool, I feel refreshed! If only I spent more time in it. 6. Did anyone notice that the O's are leading the division at the half-way point of the season? 7. Any idiot can face a crisis, it is day to day living that wears you out. 8. Smile--it isn't going to get any better unless you do. 9. I love July! I recently read about a couple that spends the year chasing Summer. I wish that were me! My Saturdays are often devoted to sporting activities--usually for the grandsons. Yesterday was a different Saturday. I played golf in the morning and attended a long Orioles game in the afternoon. I spent five hours golfing (including travel) and five hours at the orioles game (including travel). 10 hours of sports related activities. My Fitbit recorded over 20,000 steps--and I didn't even try! The golf game was a bit ragged yesterday. I am a much better player in the afternoon it seems. It was a great day on the course, until the sun decided to come out with a vengeance and it just got incredibly hot! One of the highlights of the round was a goose honking vociferously at Jeremy after he hit a ball too close to it. The goose was indignant! We just laughed. The Orioles late-afternoon game was fun! 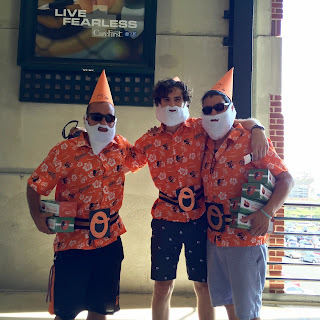 It was Manny Machado garden gnome day. Everyone attending the game got a gnome. Fortunately, our seats were in the shade given the 4:05 PM start. It was a hot, slow baseball game that officially took 3 hours and 14 minutes to play in the hear. Over 43,000 fans were in attendance to see the Orioles grind out a 3-2 win! And it was a grind. I love Saturdays like this one! I read a very difficult editorial in the New York Times this morning. It was titled "What White America Fails to See," and I found it difficult to internalize and accept. Yet, I know there are truths contained inside the words that Michael Eric Dyson wrote and I feel his hurt and frustration. I wish that we were a multi-cultural nation of equals. I wish the concept of America being a "salad bowl" was actually true or even close to being correct--but clearly, it is not. Multiculturalism is a difficult concept and it is clear from the virulent words of at least one candidate for president, not understood or fully appreciated. Maybe it was easier when America was "melting pot." Even if the concept was a facade, we believed that we could operate from a singular point of view across different ethnicities. I can see how America was built upon the backs of the newest groups of immigrants in history. The cities and the railroads and the critical infrastructure were built by those newest to America. Yes, that a gross generalization, but fundamentally accurate. As the newest immigrants assimilated, they became Americans and were, mostly, accepted. But some groups, cultures, were never accepted; hence, multiculturalism has always been with us but the majority were blind to the inequity. The police shootings of the past two years highlight the cultural differences. 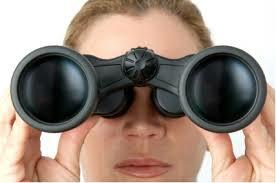 The author of the editorial this morning suggests that we view other cultures through binoculars. That resonated with me. We watch from a safe distance and make judgements without experiencing the the reality of life happening where the binoculars are looking. Some of the hard words that he wrote cut deeply. You hold an entire population of Muslims accountable for the evil acts of a few. Yet you rarely muster the courage to put down your binoculars, and with them, your corrosive self-pity, and see what we see. You say religions and cultures breed violence stoked by the complicity of silence because peoples will not denounce the villains who act in their names. Yet you do the same. You do not condemn these cops; to do so, you would have to condemn the culture that produced them — the same culture that produced you. Black people will continue to die at the hands of cops as long as we deny that whiteness can be more important in explaining those cops’ behavior than the dangerous circumstances they face. "Black Lives Matter." I have heard many smug people, including some political candidates, insist that "All Lives Matter" and I too, for a while was blind to the deeper meaning of the cry. Yet, even though my binoculars are still firmly in my hand, I am appalled at the events of the past two days and I am fully aware that a white person in either of the situations in Louisiana or Minnesota would not have been executed by the police. And that is the problem. I watched the video of the Minnesota shooting. There are a lot of things in that video that are just wrong. My Take: It was wrong! It was murder. Even I am afraid. My tractor reached a significant maintenance milestone. There was a lot of work that needed to be don't to maintain its enthusiasm for cutting the grass and helping with other mundane duties around the house . I took an image of all of the parts that were being replaced. I had already swapped out the blades when I took the shot, but there are many parts being replaced to ensure continued years of faithful service from one of the unsung heroes around the house. Frankly, I was appalled at the cost of all of the parts. I believe that I could have purchased a push mower for the price of the parts in the image. Sears, where Purchased the parts, did not make the process easy. 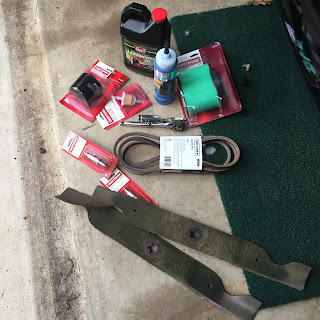 The parts good was difficult to read and then, in the end, one of the parts was wrong--the mower drive belt. The belt in the book was for a 42 inch mower deck and I have a 46 inch mower. So the inevitable return is at hand to actually complete the process. Nothing is ever easy, it seems. Chris and I rescue some of the strangest creatures from our pool. Usually it is a stray toad or hoards of frogs (almost akin to the Biblical plagues of Egypt) that are helped to safety. Sometimes it is a really unique animal like the bunny we rescued a couple of years ago. We have, in the past, rescued a bat, a bird, and an assortment of snakes--usually small hatchlings who got confused. Mammals generally do not do well and drown before we can get to them. Yesterday, however, I saw something that really got my attention--a cicada on a leaf floating in the pool. 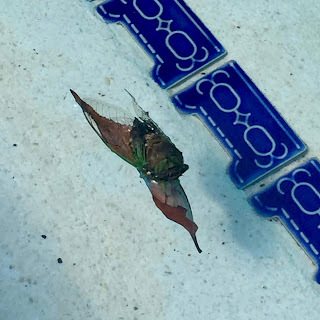 I'm not sure how the bug got there and managed to float until rescued. It looks to me like it had commandeered a ship and was sailing until dawn or something. 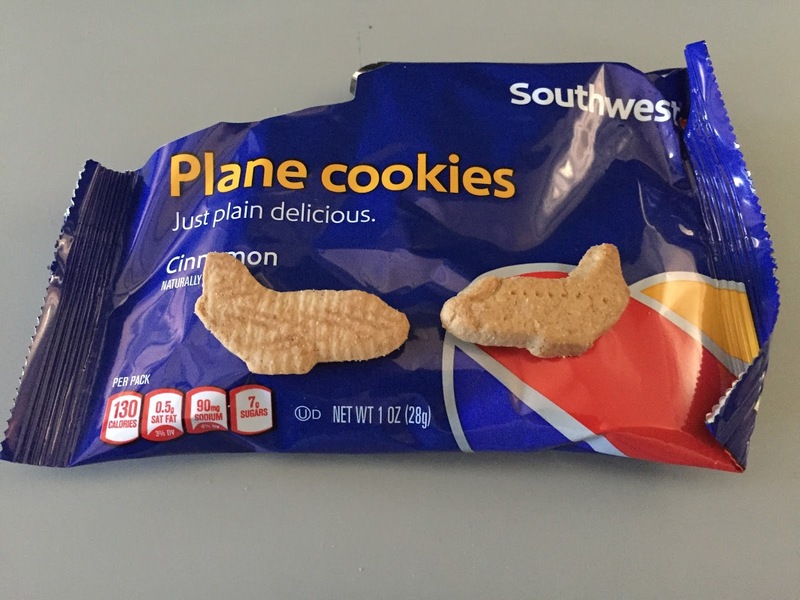 On one of my recent Southwest Airlines flights I received a new treat for my flying enjoyment: Airplane Cookies!! It was an early morning flight and the cookies were my breakfast--well partly. Not really--it dawned upon me that they were animal crackers in disguise! But there were not just plain cookies, they were plane cookies and I thought they were cute. Just like animal crackers, except there was only one plane. Oh yes, Southwest only flies one type of plane--the Boeing 737! The cookies were, however, both cute and tasty. I also had a couple cups of coffee which helped shake off the drowsiness of getting up at 3:30 AM to catch a 6 AM flight! Ugh! Why did I make the reservation for so early? 2. Mondays that fall on Tuesday are the toughest days of the week. 3. 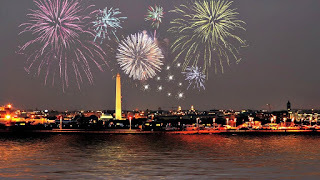 John Adams wrote that the Fourth of July "...ought to be celebrated by pomp and parade, with shows, games, sports, guns, bells, bonfires, and illuminations from one end of this continent to the other..."
4. There is something great about starting the day on a golf course, even if I'm not playing very well. 5. We enjoyed fireworks yesterday in advance of the expected storms this afternoon. The whole neighborhood seemed alive with explosions and bright displays, almost as John Adams intended. 6. 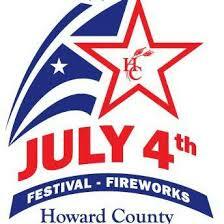 Some places are rescheduling the fireworks--it is possible to get three nights of fun and explosions. 7. Many dogs hate fireworks. 8. 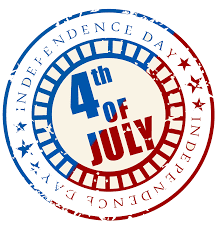 Enjoy your fourth and be safe. Strike up the Band--or Not! Military bands are under attack by the Congress. 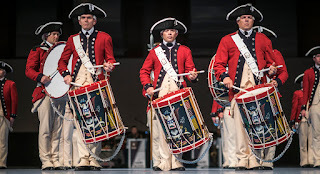 The New York Times, in an article titled Military is Asked to March to a Less Expensive Tune, reports that the budgets for military bands are being reduced in and effort to help the military achieve its end strength goals. The article traces some of the history of US military bands and notes that in 1862 there were nearly 15,000 bandsmen in the Union forces. I have often enjoyed the music of military bands. 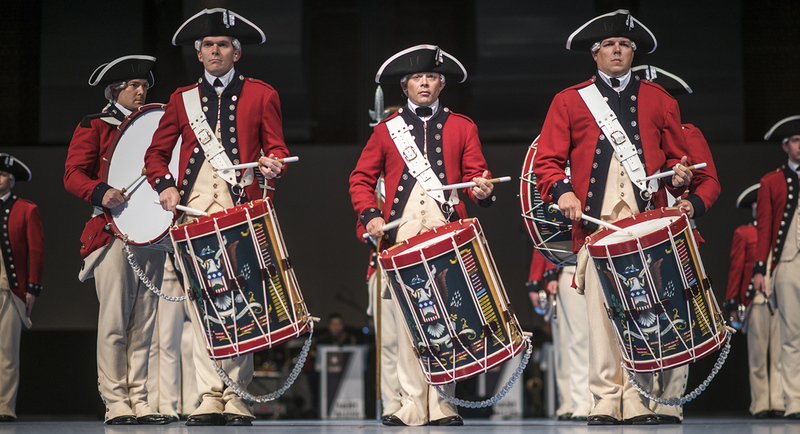 The patriotic sounds, not played anywhere else, represent a unique piece of American history that could easily be lost if the military were not preserving it for future generations. The article does point out that the DoD spends more on music than any other part of the government. But, does that make it wrong? Leaders in the Pentagon quietly grumble that by focusing on bands, Congress is going after small potatoes. The military has for years proposed base closings that it estimates would save more than $2 billion a year, but Congress has not acted on the politically troublesome proposals that could cut jobs in their districts. I love it when Chris makes up a batch of brownies. I usually means we are headed somewhere to meet with friends and that there will be an assortment of desserts. I especially love brownies served with vanilla ice cream and chocolate syrup covered by a mound of whipped cream. And now I learn that a third grader in Collingwood, New Jersey, was subjected to police interrogation because of a simple statement made in reference to the delicious dessert being served at the end of the school-year party. 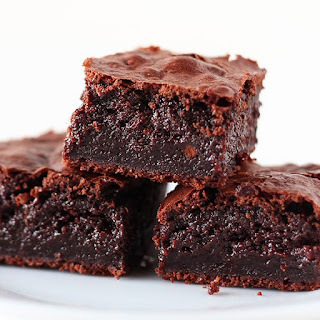 According to The Inquirer in an article titled Why police were called to a South Jersey third-grade class party, a 9 year-old boy made a comment about brownies being served to the class, in reference to the end of the year party. Another child exclaimed that it was a racist remark and police were called. Sadly it does not end there. "The boy's father was contacted by Collingswood police later in the day. Police said the incident had been referred to the New Jersey Division of Child Protection and Permanency. The student stayed home for his last day of third grade." It is clearly a policy that was poorly implemented. 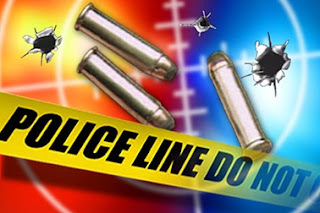 The article indicates that police have been called to investigate incidents was many as 5 times per day in a school district with a total enrollment of 1,875 students. Given that there are only 14,000 residents in the borough, I cannot imagine there are too many police officers remaining in the community to handle more serious matters. One mother opined "Are we going to have to send kids to school with a lawyers name and number?" As a society we are losing our perspective and the ability to resolve disputes at the lowest level. There is too often a rush to call police and a lawyer. My Take: The police and the courts need to begin to help people develop common sense by enforcing regulations against frivolous police reports and lawsuits. Brownies do not have any other name! It is with great fanfare that I announce the start of the uniquely summer month of July! July has arrived. Hail Caesar! Cue the beach, waves, sand, surf, and fireworks! After a Springtime that was so cold and rainy that I thought summer would never arrive, July has finally moved onto the scene as the year 2016 slides into the second half of its run. The weather, lately, has been almost idyllic with limited rain and moderate temperatures. The vacation season is upon us and my plans are pretty well set. 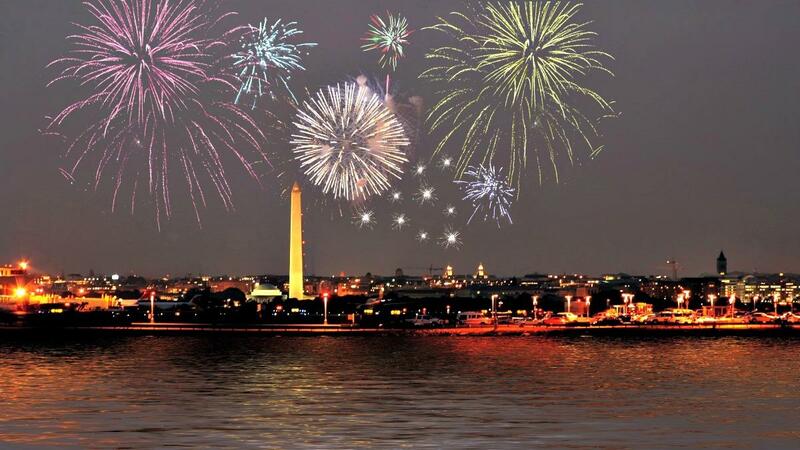 The month gets off to a great start with Independence Weekend--the holiday with a bang! It is great when Independence Day coincides with a weekend. That will not happen again until 2020 since the holiday will fall on mid-week days for the next three years. Not to get too far ahead of the action, let's stick to the weekend at hand. Drive safely, if you handle fireworks do not over imbibe alcohol, and generally be responsible. Enjoy the 4th, and better yet--enjoy July. Did I mention that July is my favorite month of the year? I wish that July would never end or that I could live in the land of perpetual summer.